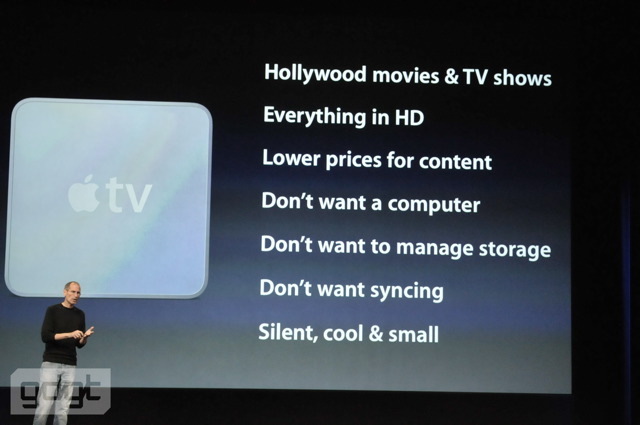 tl;dr: The new AppleTV is a huge disappointment. Welcome to AppleTV 2007. Why does the lack of Apps matter? Because we’re left with only ABC & Fox for TV shows. Where’s everyone else? I thought we wanted ‘professional content’ but we get two networks? Customers are dying for some disruption to the cable business, and instead we get a tiny fraction of cable’s content? Then we’re left with Flickr for photos. Flickr, really? When Facebook has 5-6X the photo sharing usage of all other photo sharing sites combined? And heaven forbid you want to watch your HD videos or photos from SmugMug – we’re only the 4th largest photo sharing site in the world, clearly not big enough if Facebook isn’t. Every network could distribute their own content in whichever way they wished. HBO could limit it to their subscribers, and ABC could stream to everyone. Some would charge, some would show ads, and everyone would get all the content they wanted. Hulu, Netflix, and everyone else living in perfect harmony. Let the best content & pricepoint win. We’d get sports. Every geek blogger misses this, and it’s one of the biggest strangleholds that cable and satellite providers have over their customers. You can already watch live, streaming golf on your iPhone in amazing quality. Now imagine NFL Sunday Ticket on your AppleTV. You could watch your Facebook slideshows and SmugMug videos alongside your Flickr stream. Imagine that! The AppleTV might become the best selling video game console, just like iPhone and iPod have done for mobile gaming. Plants vs Zombies and Angry Birds on my TV with a click? Yes please. Apple makes crazy amounts of money. Way more than they do now with their 4 year old hobby. Apple has a go-to-market strategy. Something like 250,000 strategies, actually. They’re called Apps. The new AppleTV runs on the same chip that’s in the iPhone, iPad, and iPod. This should be a no-brainer. What’s the hold up? What’s that you say? The UI? Come on. It’s easy. And it could be the best UI to control a TV ever. Just require the use of an iPod, iPhone, or iPad to control it. Put the whole UI on the iOS device in your hand, with full multi-touch. Pinching, rotating, zooming, panning – the whole nine yards. No more remotes, no more infrared, no more mess or fuss. I’m not talking about looking at the TV while your fingers are using an iPod. I’m talking about a fully realized UI on the iPod itself – you’re looking and interacting with it on the iPod. There are 120M devices capable of this awesome UI out there already. So the $99 price point is still doable. Don’t have an iPod/iPad/iPhone? The bundle is just $299 for both. That’s what the AppleTV should have been. That would have had lines around the block at launch. This new one? It’s like an AppleTV from 2007.